Taylor Swift feat. Brendon Urie - 'ME!' music video below. LANY & Julia Michaels release new song 'okay'. Lauv releases new song 'Drugs & The Internet'. Interview: Broods on their new album, ‘Don’t Feed The Pop Monster’. 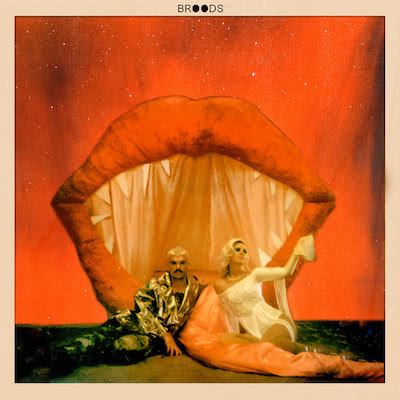 On their brand new album ‘Don’t Feed The Pop Monster’, Broods push their musical boundaries to new heights of greatness - from the ‘Alice In Wonderland’ referencing ‘Dust’, the notably upbeat pain anthem ‘Hospitalized’, to ‘Too Proud’ which sees Caleb Nott take lead vocal duties. And having just announced two New Zealand shows (Christchurch on March 22, Auckland on March 24), the duo will bring these brand new songs back home before heading off on an American tour in April. COUP DE MAIN: We love 'Don't Feed The Pop Monster' so much! You open the album with ‘Sucker’, which is a really bold statement - “Just lost myself just trying to be like somebody else,” is a really powerful line. Do you think self-discovery, and learning to fully be yourself, is an important part about growing older? BROODS: I think it’s inescapable. Being in our early twenties we’ve both been hit with a lot of growing pains. Just when you feel like you’ve figured something out, there is something else new to navigate. It feels like you’re feeling around in the dark most of the time. I think keeping up with other people and staying relevant doesn’t necessarily mean following trends though. That was a lesson we learnt when we started to lose ourselves amongst other people’s expectations for us. Expectations can be toxic. CDM: The music industry can be really harsh, especially in the way that they want to ‘construct’ or ‘create’ the next big thing by following trends, and what they think will succeed. Why do you think this can be such a dangerous thing, especially for the artists they are trying to change? BROODS: I think being a green 19-year-old when we first got signed made me quite vulnerable to being shaped by other people. My attitude was always, “Just happy to be here!” It took a long time to realise that we got here because we’ve worked towards it since we were kids. We were made to feel so lucky to have opportunities, which is true to some extent, but I prefer to think that we are fortunate. Luck did not get us here. We got us here. One of the greatest gifts I’ve ever been given was a mug that said, “If you don’t decide who you are going to be, somebody else will.” I’ve been learning that lesson over and over in many aspects of my life. We will wake up one day and have no idea who we are if we don’t practice self-awareness. I think that is the thing that keeps you on track through all the many versions of yourself. CDM: “It isn’t enough to pretend anymore,” you proclaim in ‘Dust’, which is one of my favourite songs on the album. What do you think it is about pretending that can be so easy to fall into? BROODS: I have a habit of building my own world up around me when I feel out of place in this one. I can get very invested in an alternative reality at times. I think there is some beauty to being able to create different worlds with nothing but your own imagination. We need people like that. Without them we wouldn’t have Harry Potter! But in saying that we still have responsibilities in the real world that we can’t abandon. I am constantly flirting with the mad side of myself and playing around the portal that connects my two worlds. This song has become a friendly reminder to check myself before I wreck myself. CDM: In that song you also sing, “I’ve been trying to find a place I’m from.” Do you feel like with ‘Don’t Feed The Pop Monster’ you're more ‘at home’ with your place in the music industry? BROODS: This is definitely the closest we’ve been to our place. I think our experience of the industry evolves so quickly and constantly, it’s important to take the moments you need to be grateful and absorb where you’ve come, but at the same time, keep moving forward. Time doesn’t stop moving and neither does our evolution as individuals. CDM: Caleb, what was it about ‘Too Proud’ that made you want to sing on that song? BROODS: We were just laying down ideas for vocals and Caleb started singing that chorus. The whole song just started to feel like his to express. We just rolled with it because it felt right. I think fans are ready to hear him in this way. CDM: The song has such a relatable sentiment - pride can be such a vicious emotion in humans. What do you think is the strongest human emotion? BROODS: Fear. People that can let fear have its place without submitting to it like a slave, have the world at their feet. Fear can also rule a lot of our other emotions. How we love others and ourselves. How we communicate and express ourselves. There is always an element of fear pushing and pulling us around. The beautiful thing I’ve learnt is that when you take the power away from fear, you get so so much closer to your most authentic self. That's something I’ve found naturally happens as you get older and less influenced by other people’s expectations. CDM: I really love the production on Georgia’s voice in ‘Falling Apart’ - how did you guys find experimenting with different production and musical elements on this album? BROODS: We wanted to make the kind of music that we listen to. On the last record we had this constant voice saying, “Is this song going to work for radio?” That voice was silenced through the making of 'Don’t Feed The Pop Monster' and that was really liberating. It all comes back to letting go of other people’s expectations and finding out authenticity. We realised we are not at all useful to the world as anything less than 100% honest. CDM: You’re taking the album on tour in America in April - are there any songs from the album that you’re particularly excited about playing live for the first time? BROODS: All of them. This is the first record we’ve made that we’ll play every track live. They all have really special significance for different reasons and when we play them live to the people that have supported us throughout our careers, that connection we can have with our fans is incomparable . CDM: What was it like debuting ‘Old Dog’ live at the Neon Gold birthday party? BROODS: So dope! That is such a fun one to play live. I feel like an empowered badass when I sing that. CDM: ‘Hospitalized’ is another standout track on the album, especially the juxtaposition between the super upbeat instrumental and the lyrics where you sing about being broken and pushing yourself to the edge. Did you write those lyrics specifically for the instrumental, or did it come later? I can imagine the song being quite different with a slower, sadder instrumental. BROODS: We tend to write everything simultaneously. When we are in our most inspired headspace (which we were when writing this), it just all comes out at once quite naturally. It becomes an almost subconscious process. There are a lot of songs we’ve written that I haven’t completely understood their gravity until I’ve sat with them for a while. When you keep open, things your brain can hide from you emerge. I’ve sung about my feelings before I’ve even understood them many times. CDM: What was running through your mind when you wrote that main chorus line in ‘Hospitalized’? BROODS: I was very excitable that day if you can believe it haha. I kind of just let my mind flow freely and chucked out any filters. The whole concept of the song was born from a conversation we had that morning over breakfast about who had broken bones and who hadn’t. There was a unanimous curiosity amongst those of us who hadn’t been through that experience. I think we have all had times where we secretly wished we could replace emotional pain with something physical. An arm in a cast is more straight-forward than a brain in turmoil. CDM: What was it like working with Marina on her song ’Emotional Machine’? We saw videos of the live performance, it looks like a rad song. BROODS: Working with Marina was dope! She came to our first ever show in London five years ago and has been a Broods supporter pretty much our whole career, so to get in the studio was special. Playing the song live was amazing too. It’s one of those things that you have to take a moment to absorb and think back to your teenage self who dreamt of being a part of something like that. CDM: The ‘Peach’ music video was a really cool exploration of commercialisation in pop music (plus introduced everyone to your alter-ego!) - what made you want to explore those themes in such a surreal video? BROODS: The ‘Peach’ video was definitely the most fun we’ve had on a set. We just sort of let it happen. Sam Kristofski (the director) is an old family friend from home so we had a lot of trust in his vision. The whole surreal chaos is quite fitting to the song too. The song is about that chaos that we are constantly trying to make sense of so the video is pretty perfect. CDM: Georgia, you did the Venus Project last year which was such an empowering project to watch pan out. Have you started thinking about Volume 2 of that project? BROODS: I’m always thinking about the next step for TVP. Right now I’m focusing all my efforts on Broods but TVP has not been forgotten. CDM: It was so cool to see a project helmed by women, worked on entirely by women. In actress Jameela Jamil’s Nylon cover-story from December, she talked about how beauty standards are decided upon by straight white men, saying, “Just make sure you’re physically desirable to straight men, and then you are allowed in the room. And if you’re not physically valued by straight white men, then you’re just taking up space in the universe.” Do you think it’s important to change the way that these ‘rooms’ exist, particularly by working with other women to change this? BROODS: I have found that I go into these ‘rooms’ holding myself staunchly so to be taken more seriously. I do think we are seeing a change in how women are expected to present themselves but it is slow and there is a very long way to go. It takes a lot of courage to actively not care what people think of you, especially in a physical sense as a woman after being trained that a huge chunk of your worth lies in your appearance, but I’m getting there. MusicBroods - 'L.A.F’ music video. MusicBroods - 'Mother & Father' music video. MusicBroods - 'Free' music video. MusicBroods announce new album, 'Conscious'. MusicBroods - 'Mother & Father' live for Seth Meyers. MusicLive: Broods - Vector Arena, June 2014. MusicCDM presents: Broods' 2015 NZ Evergreen Tour. MusicInterview: Broods on their debut album, 'Evergreen'. MusicAlbum review: Broods - 'Evergreen'.